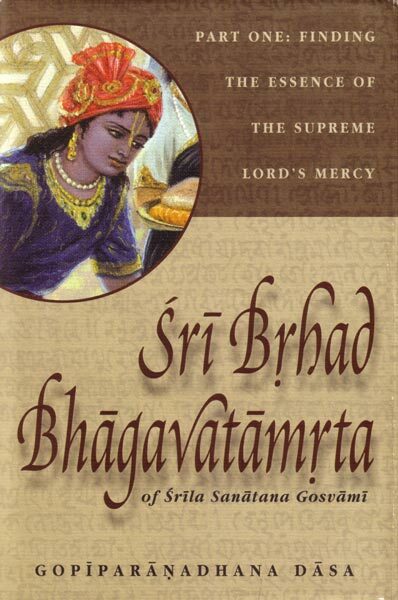 Sri Brihad-bhagavatamrita is an epic work composed in Sanskrit during the sixteenth century by Sanatana Goswami, one of Chaitanya Mahaprabhu's leading disciples. It is one of the first books written by any of the Six Goswamis of Vrindavan. In three volumes, it gives an easily readable account of two great spiritual quests. In one, the Vedic sage Narada searches throughout the universe for Krishna's greatest devotee. In the other, the cowherd boy Gopa Kumar searches for Krishna Himself—the Supreme Person, the ultimate goal of life.